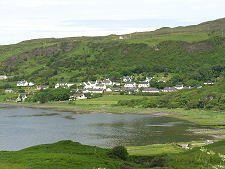 Uig tends to be seen as less a part of Skye than a stepping stone en route to the Western Isles. It is from here that you catch the ferry to Lochmaddy on North Uist and Tarbert on Harris. 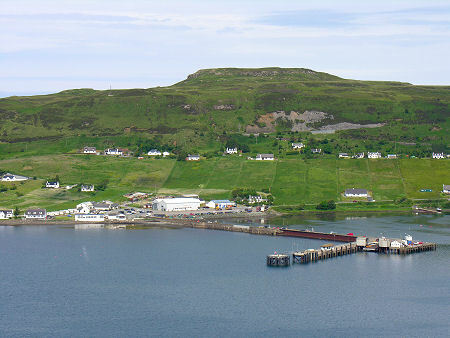 But while the life of Uig does rotate around the ferry terminus, there's a lot more here besides which, coupled with its spectacular setting, makes Uig well worth a visit in its own right. Uig is strung out around the wonderful south-west facing amphitheatre of Uig Bay. It is the largest settlement on Trotternish, the most northerly of the collection of peninsulas that come together to form the Isle of Skye. A road was built to Uig from Portree in 1812, and by 1840 a pier had been built and steamers were providing regular services to Tarbert on Harris, Lochmaddy on North Uist, and elsewhere in North West Scotland. 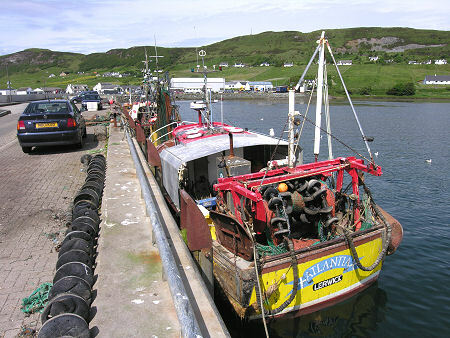 The steamers were replaced by a car ferry in 1963, and the terminus you can see on the north side of Uig Bay was built. 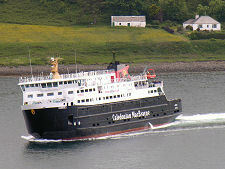 Today the service is operated by the MV Hebrides. The long pier projecting into the bay to serve the ferry is also used as a base for local fishing vessels. 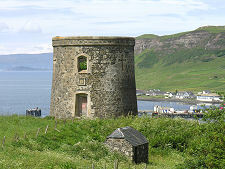 A stroll along the pier is an enjoyable way to see Uig from a different point of view (see the image at the foot of the page). Be warned, though, that it can be a very busy place when the ferry is loading or unloading. And even at other times, large refrigerated lorries waiting to take prawns and crabs direct to markets to France and Spain are a common sight. The terminus and its associated buildings provides the main focus for Uig. The rest of the village can been summarised as two pubs, two shops, two churches, two pubs, a hotel, a brewery, a pottery and a petrol station that doubles as a cafe. You will also find a range of available accommodation, including a camp site. 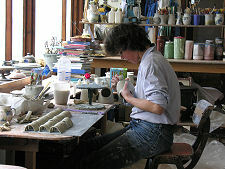 Two businesses are well worth a visit. 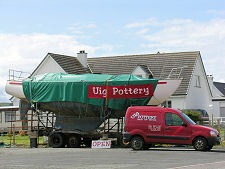 The Uig Pottery offers a range of high quality pottery which is produced in their premises near the pier, where you can see it being made: its location is advertised by a sign on a yacht on a trailer! 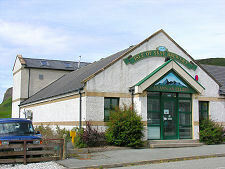 The Skye Brewery sells its own superb real ales from the brewery shop here. 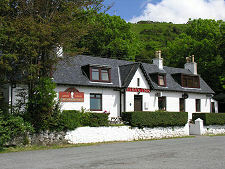 We recommend their "Red Cuillin" as one of the best medium bitters you are likely to find anywhere. 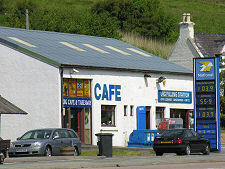 Further around Uig Bay you come to the very appealing Ferry Inn, one of the pubs mentioned above, which does evening meals, complete, as its sign says, with accommodation. On the south side of the bay the road climbs up past the very striking white-painted Uig Hotel, next to the equally striking (and equally white-painted) church. 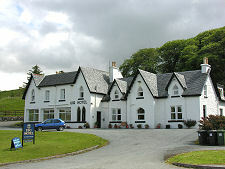 The Uig Hotel is probably the best place in Uig for an excellent lunch. 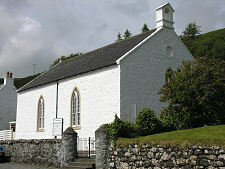 There is also a Youth Hostel on this side of the village. Some of the best views of Uig are to be had from the road south as it climbs out of the bay. From here you can look out over the harbour and the higher ground to the north. Close by is Captain Fraser's Folly. This circular tower is vaguely castle-like but turns out to be a folly, built as you'll have guessed from the name by the laird of the day, Captain Fraser: and it dates from the 1890s. It is on private land and not open to the public.